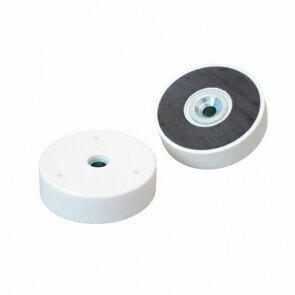 These Excello pot magnets with plastic coated pot belongs to the group of exclusive magnets. Thanks to the plastic coated pot this magnet has an exclusive white surface and is often used for applications with high demands regarding the design and exterior looks of the magnet. The magnet provides the same efficient gripping and holding qualities as the traditional pot magnets. They are characterized by having a ferrite magnet enclosed in a metal or plastic pot. This ensures strong protection of the magnet and the pot facilitates different types of thread for solid mounting. The Excello pot magnets are highly flexible products which are easily moved and adjusted according to the current demands.